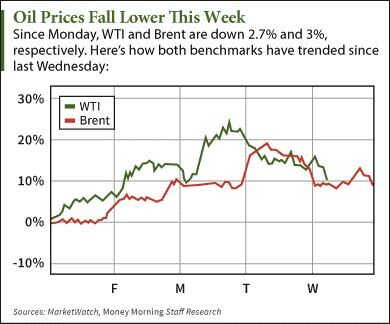 WTI crude oil prices today (Wednesday) fell below $44 a barrel in response to a new weekly inventory report from the U.S. Energy Information Administration (EIA). At 10:50 a.m., WTI crude oil prices were down 3.13% to $43.99 a barrel. The U.S. benchmark is coming off an extremely volatile month. It plummeted 20% during the first three weeks of August before soaring 29.3% during the final week. Futures are already down 10.2% this week. Brent crude oil prices had a less volatile morning. The international benchmark fell 2.03% to trade at $50.13 a barrel. It's down 10.2% since Monday. Today's drop came after the EIA released its weekly U.S. supply report. The agency stated that oil stockpiles increased by 4.7 million barrels last week. Analysts polled by Platts expected a decrease of 800,000 barrels. Total U.S. production was 7.9 million barrels a day last week, up from 7.2 million the week before. The decline also came after OPEC announced this week that it's "ready to talk to all other producers" about how to deal with the oil price rout. The cartel has become desperate as oil-rich countries like Venezuela and Libya depend on high oil prices to stabilize their economies. But Saudi Arabia, the de facto leader of OPEC, likely won't cut production to help boost oil prices. That's because the country's only concern is holding on to as much market share as possible. After all, its supply of the global oil market has shrunk from 60% to 40% in recent years due to surging U.S. production. Despite these forces working against crude oil prices, there are still plenty of ways to profit from the energy sector.